Cyber-threats cannot be managed without an efficient digital monitoring scheme. Personal, political and economic interests must be protected online at all times. Public perception and reputation building for international brands, politicians, governmental institutions or HNWI. KBSD is a Swiss consultancy founded in 2009 specialized in surveillance, protection and online influence. Build & control a strong, coherent & positive online influence, on a local or global scale. Understanding, navigating & impacting the global digital continent. You have questions, need information, want to talk with our Digital Bodyguards? Swiss digital intelligence since 2009. Cyber-threats cannot be managed without an efficient online monitoring scheme. We understand and operate the digital landscape beyond conventional methods and have developed the ultimate surveillance tool. Personal, political and economic interests must be protected online at all times. Through consistent proactive digital engineering and expert interventions, make sure your digital assets are secured, set up and contribute to your mission. Influence consists of building the public perception and reputation for international brands, politicians, governmental institutions or HNWI, among others. With its Intelligence-based PR methodology, our Public Relations team is supported by unparalleled digital expertise. The efficiency of surveillance capabilities sets the tone for Cyber-Security. So much information and so many platforms to monitor! Working with luxury brands, multinationals and influential individuals, KBSD has identified the most client-focused and actionable methods to collect, compile and synthesize data. 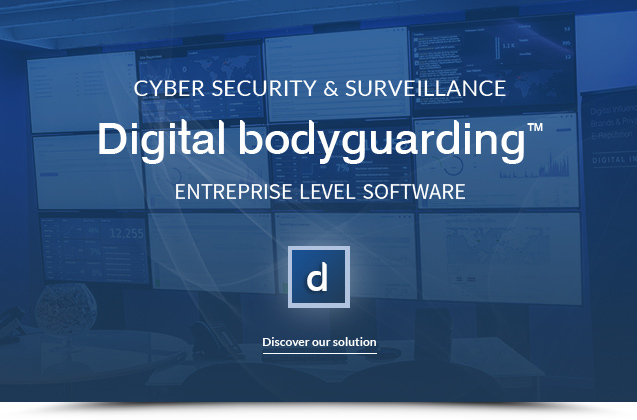 Years of reputation management missions and extensive R&D have resulted in the creation of Digital Bodyguarding™, the most comprehensive cyber-surveillance tool available today. Understand how people see you and identify reputational risks through early alert systems. Google, Bing, Yandex and even Baidu are monitored along with many other surveillance modules that allow to monitor images, the Deep Web or Wikipedia. Protecting your digital assets and controlling your ecosystem are the building blocks of a broader strategic communication strategy towards a position of authority, credibility and trust. Actions can be undertaken in a proactive fashion. Taking the time to build a solid ecosystem that will maximize your ability to take the digital floor and address your audience can prove to be critical in the future. However, you are sometimes faced with a threat you could not have prepared for. Reactive crisis management requires innovative problem-solving abilities, extensive media experience and a unique knowledge base to build from. The higher the stakes, the more your ability to efficiently influence public opinion and reach out to online communities will be key to your success. Positive influence is the de facto long-term effort that must be put in place in order to build key relationships and convey specific messages. Anti-negative influence can be necessary to counteract attacks or mount threats from unwarranted sources. Competitive influence is a service specifically geared towards brands and individuals active in extremely competitive environments. Understanding the competition and leveraging all available intel can make or break a personal, commercial or political project. Founded in 2009, KBSD SA is a Swiss Digital Intelligence firm specialized in Online Reputation Management, Cyber-Protection, Surveillance & Influence. KBSD develops and defends brands and individuals’ online assets. In total confidentiality, we strategize, monitor, protect and influence in favor of our clients’ interests. We are involved from strategy conception to post-op analysis. KBSD’s Digital Bodyguarding solution is a comprehensive technological suite with a dedicated professional support and oversight team. We call them our Digital Bodyguards. After 6 years of tactical missions in digital intelligence and reputation management, we have now streamlined our protection plans. You, your brand, or your government do not only have access to a software or services. You get a full bodyguarding solution. KBSD® is a registered trademark in Switzerland and the United States. Digital Bodyguarding™ is a trademark of KBSD - All rights reserved 2016.